2016 Copa America Centenario Match Schedule in IST (Indian Standard Time) are given below. 2016 Copa America will be held from 3 June 2016 to 26 June 2016 in United States. Copa America Centenario is 45th edition of Copa América, there are 16 participants and 32 matches in this tournament. SonyKIX will broad cast all games live in India, Pakistan, Afghanistan and Nepal. There are four groups for 16 teams. Each teams of the group play one match against other teams in the same group. Each team of the 2016 Copa América Football gets 3 points for 1 winning and one point for draw matches. 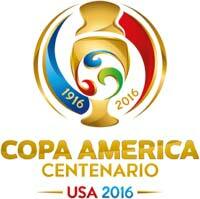 The inaugural match of 2016 Copa America Centenario is between United States and Colombia, the match will be on 3 June 2016 at Levi's Stadium, Santa Clara. On 4 June 2016 (IST), Costa Rica and Paraguay compete in second match of 2016 Copa America. Haiti and Peru compete in third match of 2016 Copa America on 4 June 2016 at 6:00 AM (Indian Time). Quarter final matches of 2016 Copa America is scheduled between 16 June 2016 and 18 June 2016 (IST). Semifinal matches of 2016 Copa America will be played on 21 June 2016 and 22 June 2016 (IST). Uruguay is the most successful team in Copa America, they won 15 titles. Argentina won 14 times and Brazil won 8 times. Paraguay (2), Peru (2), Chile (1), Colombia (1) and Bolivia (1) also won Copa America. On 4 July 2015, Chile (1st title) won 2015 Copa América by defeating Argentina for 3 goals lead (score 4–1) in Penalty shoot-out at Estadio Nacional, Santiago. The first semi final match of 2015 Copa America was between Chile and Peru, Chile won this match for 1 goals lead (score 2–1). Argentina and Paraguay played in second semi final match of 2015 Copa America and Argentina won by 5 goals lead (score 6–1). Uruguay won 2011 Copa América by defeating Paraguay for 3 goals lead (score 3-0). Uruguay played semi-final of 2011 Copa America against Peru and Uruguay won for 2 goals lead (score 0-2). On 20 July 2011, Paraguay played second semi-final of 2011 Copa America against Venezuela and Paraguay won for 2 goals lead (score 5–3) in Penalty shoot-out. Brazil (8th title) was the winner of 2007 Copa América, Brazil played final match against Argentina and won for 3 goal lead at Estadio José Pachencho Romero, Maracaibo. Brazil played their semi final match against Uruguay, Brazil won in Penalty shoot-out for 1 goal lead (score 4–5). Argentina played second semi final match of 2007 Copa América against Mexico and Argentina won for 3 goals lead (score 0–3) on 11 July 2007 at Polideportivo Cachamay, Puerto Ordaz. I am a big fan of Argentina, i think Argentina will play in final match of 2016 Copa America. you have given 2016 Copa America in Indian Time, thanks bro..
thanks for this post " 2016 Copa America Centenario Match Schedule in IST (Indian Standard Time) "
who will be the winner of 2016 Copa America ?, Argentina and Brazil have any chance for it ? Argentina and Brazil have very big role in 2016 Copa America. Argentina is gonna win 2016 copa america. I am big fan of Messi. Brazil is gonna win 2016 copa america.